Several hundred Gazan students rallied in central Gaza on Wednesday in a show of solidarity with the ongoing anti-government protests in Egypt, AFP correspondents said. "Gaza salutes the Egyptians" they shouted, denouncing embattled President Hosni Mubarak as "an American collaborator." 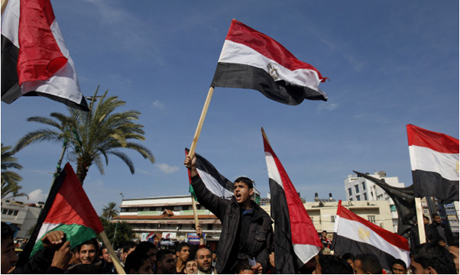 Waving Egyptian and Palestinian flags, they also shouted angry slogans against Egyptian Vice President Omar Suleiman and Prime Minister Ahmad Shafiq. Earlier on Wednesday, Egyptian immigration officials told AFP they had been ordered to bar Palestinians from entering the country. An official at the Palestinian embassy in Cairo confirmed the ban but said he had been told it was a "temporary measure." It was not clear who issued the order, although security sources in the northern Sinai told AFP earlier this week that Palestinians may have been behind the sabotaging of a gas pipeline over the weekend. Egypt is in the grip of a major political crisis which began on January 25 with tens of thousands of demonstrators calling for Mubarak's overthrow. Shortly afterwards, the Egypt-Gaza border was closed, leaving several hundred Palestinians stranded on the Egyptian side, most of them who had made the trip for medical reasons, Palestinian officials said.